Red Coconut and Gulf View Shops 3001 Estero Blvd. Platted and surveyed in 1898, today's popular Red Coconut Gulf front property has been altered only by wind and surf as travellers for nearly a century return to reclaim their most sought after beach vacation destination on Fort Myers Beach. 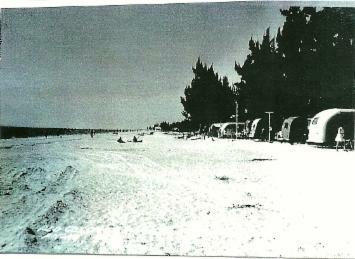 Dr. Virgil Voorhis established this trailer park in the 1920's when Estero Blvd. was then known as Eucalyptus Ave. He built a pavilion in 1932, used first as a voting precinct, then as a spiritual gathering place since there was no church on the island at that time. Later he conducted bingo games to augment monies for the first one room beach school in 1937, thus paying forward the spirit of community which still prevails tenfold at the Red Coconut pavilion today. Across the street, on Estero Blvd., Ruth and Jeff Brame built the Gulf View Shop in 1946,seen below, which flourished for many years when Jeff began selling hotdogs and hamburgers. Later, sales included ice, beer, groceries, fishing tackle and swimwear. Jeff delivered Western Union telegrams to boats at anchor in the back bay, or beach cottages that had no street numbers or addresses, which was quite an accomplishment after the busy WWII years. 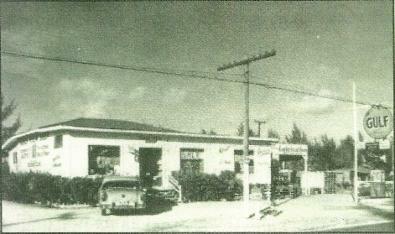 Through the years, the shop expanded, more than doubling in size, with new owners in the 1960's and again in the 1980's. Merchandise increased, adding souvenirs, postcards, and swimwear for men and women. They then expanded to more stylish clothing, exclusive gifts and exquisite handcrafted island items. 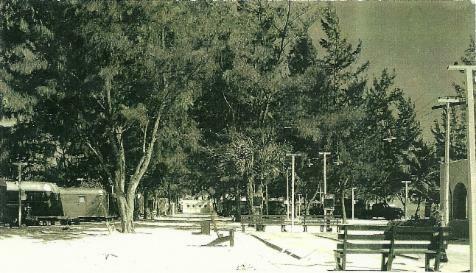 Today, the individual shops and busy year round RV park encompasses both sides of Estero Blvd., under the ownership of Fran and Tom Myers. "The Red Coconut" remains as the heartbeat within our island community as the traditions and values of Southern Hospitality are alive and well, and fortunately, extremely contagious!